The final grade for the Business and Its Environment undergraduate course at the University of Massachusetts at Amherst was published to the SPIRE web-site last week. My A grade continues the trend from my classes during the Spring and Winter sessions, a trend that will hopefully continue through the graduate class, Perspectives on Leadership, I’m still enrolled in and through the other ten classes I need to graduate. Look for updates on the final grade for the graduate course in a few weeks (class ends July 30th). 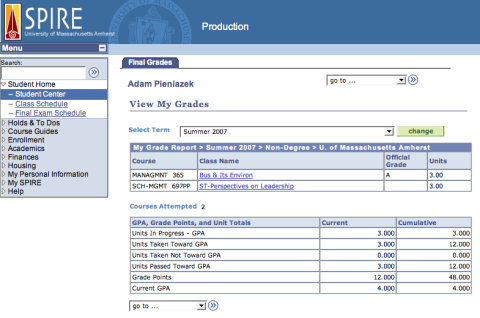 For those keeping track at home, after four undergraduate courses at the University of Massachusetts at Amherst, as of the end (for me, as I will not participate in the second session) of the undergraduate summer 2007 session, my GPA is a 4.0!